Demand for Nelson dairy farms remains enthusiastic, including interest from the North Island. Rising Fonterra and Westland payouts bode well for the upcoming season, and some good Marlborough and Nelson dairy farms are set to list in the spring. A significant August transaction was a 165 hectare 340 cow Golden Bay property, bought by a purchaser from outside the district. Meanwhile, in a notable Marlborough sale, a 2,000 hectare extensive hill country grazing property in Ward sold in August to out-of-town buyers. Listings are short in all land use types, including lifestyle properties. Any rural property offered for spring sale in the region should therefore receive an enthusiastic response from purchasers, as supply and demand factors are likely to drive prices to premium levels during the next few months. With interest evident from outside the region, Marlborough viticulture transactions will be closely watched. Optimism around dairy prospects has taken a while to reach the West Coast. However, local cooperative, Westland Milk Products had brighter news for its shareholders in the winter, providing a 40 cent advance on its payout and a markedly improved forecast, of between $6.40 and $6.80, for 2017/18. A 76 hectare Whataroa run-off property sold for $10,000 per hectare to a neighbour during July, a rare winter transaction for the region, providing a degree of encouragement for farmers, and an indication of market sentiment. Although West Coast farmers are happier than they have been for some time, spring rural property market activity is likely to be reticent. Some farmers are interested in putting land up for sale, though are reluctant to commit because they do not believe buyers will be particularly motivated. It may take a few more months to overcome this inertia. A limited number of larger Mid Canterbury dairy properties changed hands during the winter, with prices for the most desirable firm between $50,000 and $55,000 per hectare. As in much of the rest of the country, climatic conditions discouraged listings, and the market has otherwise been quiet. Contagious cattle disease Mycoplasma bovis, discovered on a South Canterbury property in late July, caused concern, though its apparent containment provided some reassurance. Farmers’ response to the increased dairy payout forecast has been low-key in Mid and South Canterbury. However, alongside their bankers, they will gain some confidence from this. A typical spring rural property market is likely in the region this year, with business as usual, and sales proceeding at a steady rate. Albeit following the wet winter, that may take a while longer to start this year than usual. Otago farms sold well through autumn and early winter, with sheep and beef properties ranging from $900 to $1200 per stock unit. Prominent among these was a 1483 hectare Landcorp property, Copper Road Farm, at Waitahuna Heights, South Otago, carrying approximately 11,000 stock units, which was acquired by a North Island purchaser in May. As in other regions, climatic conditions pushed the Otago market into a traditional winter mode, with little sales activity. Positive signs for a spring upturn include the rise of dairy prices to more realistic levels and returns for beef, lamb, mutton and venison all surpassing record levels. Sheep and beef properties, dairy farms and a large deer unit will all list for sale in spring, with the largest of these a widely admired South Otago sheep station that should attract significant interest in what is shaping as a favourable marketplace. 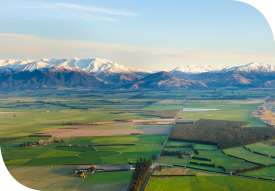 Southland winter farm sales, of properties larger than 40 hectares, were comparable to the same period last year in both values and volume of transactions. Spring in the region should see more rural property change hands than has occurred for some years, with increased optimism based on the improved dairy payout, as well as strengthening returns from sheepmeat and beef, providing confidence among both buyers and sellers. New properties will come to the market. Initially at least, sales of smaller farms will continue, though properties of greater scale should also attract attention as the season progresses. In the latter category, the sale of a unique robotic dairy unit at Gore will be closely watched. Buyers and sellers are looking more evenly matched in the region, which should result in values staying at the status quo level, albeit with increased market activity likely.